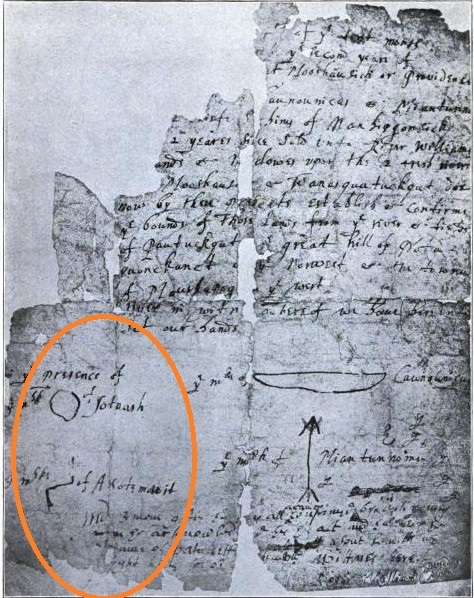 Original deed of Providence Plantations features unknown sigils originally thought to be Naragansett, but not conforming to known Naragansett iconography. According to my great-grandmother, the year was 1636 and Roger Williams and a small group of like-minded individuals were exiled from the Massachusetts Bay Colony. The history books all report that this was due to reasons of ‘religious freedom’, which was, after a fashion, accurate. According to my great-grandmother, however, the truth of the matter was that Williams and his followers were devoted to a far different path from their Puritan brethren. Williams had stumbled across something during his exploration of the local areas, or so the story goes; a broken pillar of smooth black stone with strange carvings around it in measured bands, separated by strange and indecipherable writing. Williams returned to the pillar time and time again in secret in his attempts to learn whatever knowledge it held, and a small group of people began to join him in the quest. They were discovered by the Massachusetts Bay authorities, of course, and fled into the wilderness to escape persecution and death for their blasphemies. Williams met with a Shaman of the Narragansett tribe, as the story goes, and was led to a place called ‘Sucki Nanepaushat’ or ‘Field of the Black Moon’ – a place that all Narragansetts shunned, a place where the only things that grew were choking vines and vicious thorns. Williams and his followers settled there and prospered – according to my great-grandmother they found more of the black stone carvings there, as well as idols ‘older than Earth itself’, hideous things that caused nightmares and fever-dreams in all who saw them. Williams and his followers gained knowledge there, ancient, cursed knowledge that they used to summon forth monsters and see to other worlds. They found a shining red many-faceted crystal that showed them vistas beyond their wildest imaginings. They learned arcane knowledge that man was never meant to be known. They learned, and they grew in strength and in number as more and more ancient secrets were unearthed. The Narragansetts kept clear of the place, my great-grandmother told us, for fear of what was being unearthed, but they allowed Williams and his followers to build a community there. They granted Williams and his followers the title to the land, which was called ‘Providence Plantations’ in the English tongue. It has had a different name in an older tongue, though – a name spoken by Nyarlathotep on the steps of Leng, a name shunned by the tribes of the moon and screamed into the darkness in the halls of Arkham Asylum.